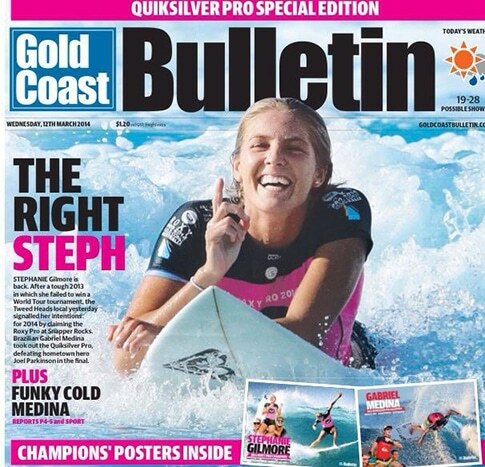 Stephanie Gilmore "2018 Woman of the Year"
PHOTO: Gold Coast Bulletin cover girl. When you claim a World Title as a 19-year-old rookie, there’s not much more left to do except keep winning. And that’s exactly what Australia’s six-time World Champion Stephanie Gilmore did. 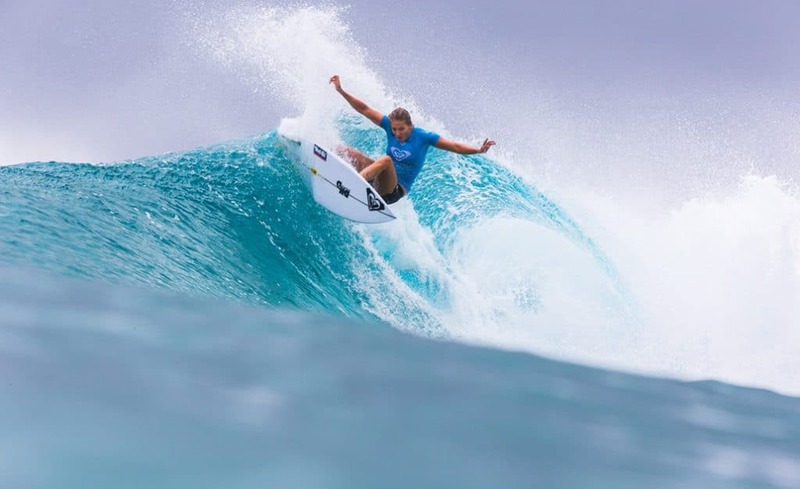 In fact, she locked down three titles in her first three years (a feat no surfer, male or female has matched) and currently holds six titles over an eight-year span. And now, at the age of 30, Gilmore is still a perennial contender for the crown, most recently winning the 2018 Rip Curl Pro Bells Beach, Oi Rio Pro and Corona Open J-Bay. She’s currently sits atop the WSL rankings and is in contention for her seventh world title heading into the U.S. Open. “Happy” Gilmore, as she’s called (thanks to her infectious smile and cheery outlook), began surfing at age 10 and quickly racked up a slew of amateur titles en route to a few wildcard entries on the big stage. At age 17, she won the 2005 Roxy Pro Gold Coast as a wildcard and then took the win as a wildcard in the 2006 Beachley Classic. While her accolades on Tour are impressive, Gilmore’s also been awarded both the Laureus World Sports Award in 2010, considered the most prestigious award in action sports worldwide, and the ESPN ESPY for Best Female Action Sports Athlete in 2011 and 2013. Born and raised on Australia’s Gold Coast, she holds 30 World Championship Tour victories and, with no signs of slowing down, Gilmore is rightly deserving of this year’s Woman of the Year honors. PHOTO: 2014 Woman of the Year Phyllis O'Donnell and 2018 Inductee Stephanie Gilmore at the Australlian Walk of Fame. PHOTO: Three Aussie Legends, Stephanie Gilmore, Peter "PT" Townsend, and Mick Fanning at ASP Awards. Wins for both Gilmore and Fanning. PHOTO: Courtesy of WSL. Photographed by Cestari. 6X World Champion Stephanie Gilmore of Australia is the WINNER of the 2017 Maui Women's Pro after defeating Malia Manuel of Hawaii in the Final at Honolua Bay, Maui, Hawaii, USA. PHOTO: Stephanie Gilmore Roxy Pro. PHOTO: Stephanie Gilmore Roxy Pro 2016.